Discussion in 'Americans and Other Western Gaijin' started by Purple Bat, Apr 6, 2017. Fantastic work on the new Gojis, Jon. I am super stoked to see more of these coming out, as I am so envious of those who managed to snag the first release. I actually really like the different blues there, but I can see why you chose the lighter version for the classic Hawaii tribute. It works so lovely on flesh vinyl, without a doubt (a colour scheme I have gone on about at length here). Japan-only is a bit of a hit, but such is the marketplace for Medicom with so many things/licenses, and something we have to come to terms with. @deafmetal Just seeing your update as I post this. Congratulations man!! Such a stunning figure. I cannot not love him. Jon's work is so fun and wonderful, I just want to take this guy on all sorts of adventures. Love him. JMRampage and deafmetal like this. Yeah - truth is most Toho/Tsuburaya stuff is Japan only for small beans dudes like me. I wish the first release could have been internationally available for people outside of Asia (thought it would be), but that’s just the way the cookie crumbled. I have a deal worked out for my Tsuburaya stuff that makes it ok for me to sell via my Webshop. The Toho license was only possible to get because of the Medicom link - so no ‘special deals’ there! Oh yeah, wasn't even griping (sorry if it sounded that way), I totally know it isn't something you can control. As you said, many of the smaller companies just get one day (e.g. festival) licenses, and even for Medicom so much stuff isn't available [for whatever legal reasons] to sales outside Japan. As I said, I think most passionate collectors on here have just accepted it, if reluctantly, and resigned ourselves to patience (and hunting). Thanks for sharing that stuff about the Tsubu licenses, Jon. I actually find this stuff fascinating (even if it is also personally frustrating), and hearing about the comparing properties is that much more interesting. I am still hopeful that Tsuburaya Inc. will eventually work out their lawsuit, to the joy of all of us decades-long loyal international fans. Anyhooo, back to cool toy news! Congrats Mark! 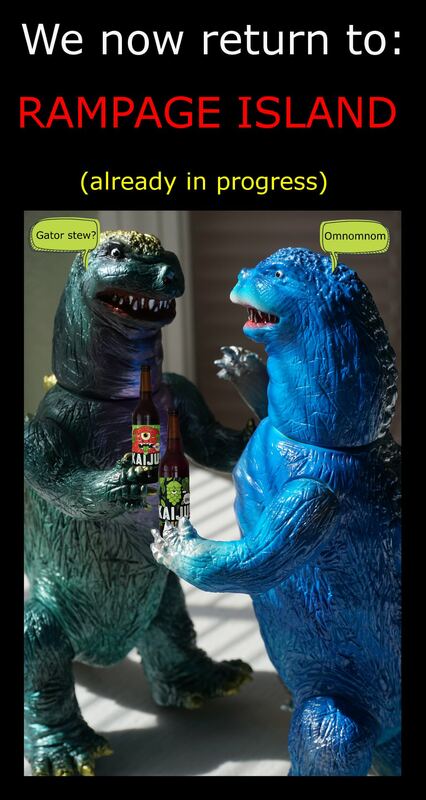 That is a nice Goji! The JP Blue, reminds me of the bootleg mold version, or Toygraph in your collection. Very nice bluey blue! Great to see a VAG set released! Alas, i hope that in the future, there is a mini purple bear, wearing a purple sakura kimono silk fragment cape -- my all time fave Rampage release! 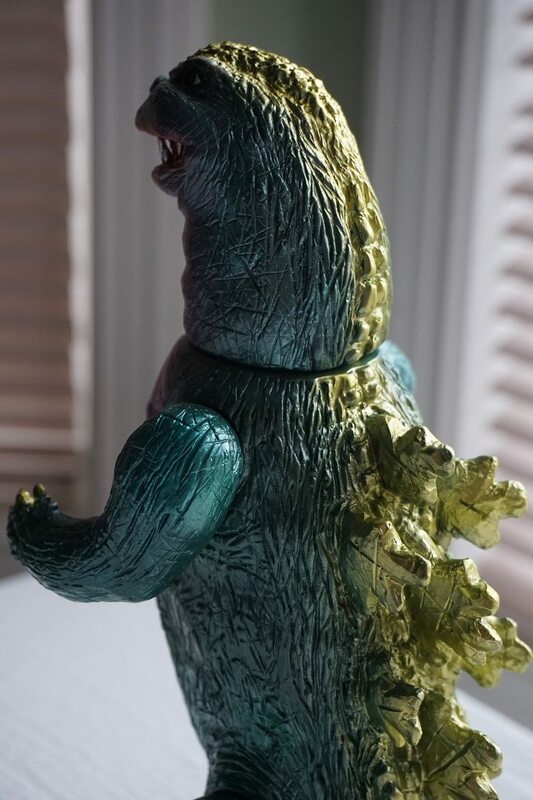 Looks great on the goji green vinyl, and I feel very lucky to land one of these beasts. For those who missed the AP's, the factory paints are still available to preorder at Vampire Robots, Entertainment Earth, or your local comic/toy shop. These AP's are so nice! Great score! Brooklyn_Vinyl, AgentRavage, boon velvet and 5 others like this. Headhunter, AgentRavage, boon velvet and 7 others like this. Oh noesss! What's gonna happen next?! Headhunter, LastResortToys, boon velvet and 5 others like this. ^^^ @deafmetal your new Gojis are so cute! They must love living with you and having so many adventures They look very huggable. The colors are so nice too! Headhunter, deafmetal and JMRampage like this. @JMRampage any hopes of getting our paws on the pink GID Pigumon? He's purty! fredrickisdead, D-.No and Mr. Humphreys like this. A really lovely Pigumon, Jon. Not surprising he sold out so quickly. Wonderful colours, they really pop and highlight your sculpt on this fun fella, and I can just imagine how nice it looks in person glowing away. JMRampage and fredrickisdead like this. Had a great time meeting the man behind rampage at five points fest and picked up an amazing science patrol clawson painted by him. D-.No, ultrakaiju, poysntixels and 4 others like this. How long before the Gojis aren't hot so I can score one? Joking. Would love one, they're mighty nice, like all the Rampages but especially the minis and micros. That Science Patrol crab is pretty easy to look at as well! Oh - it’s not hot! It’s hidden behind the veil of ‘japan only sales.’ I’ll have a painted release and some blanks at Summer Slime with @Paulkaiju and Bwana then some at SUFES in September. Headhunter, 3wing, MonstaIslandCzar and 1 other person like this. Pre-orders for a released figure? What am I missing here? Are they just using an old photo, is there slight changes I am not immediately aware of? Or is this a made-to-order 're' release? I am really happy to see Jon's figures finally get some release outside of Japan (even if, sigh, it is always US-centric), just not clear on the specifics of how this EE version fits in. As I recall they did something similar with their 'exclusive' Pretty Gojis (and a few other Medicom releases), though those were not a pre-order if I remember. 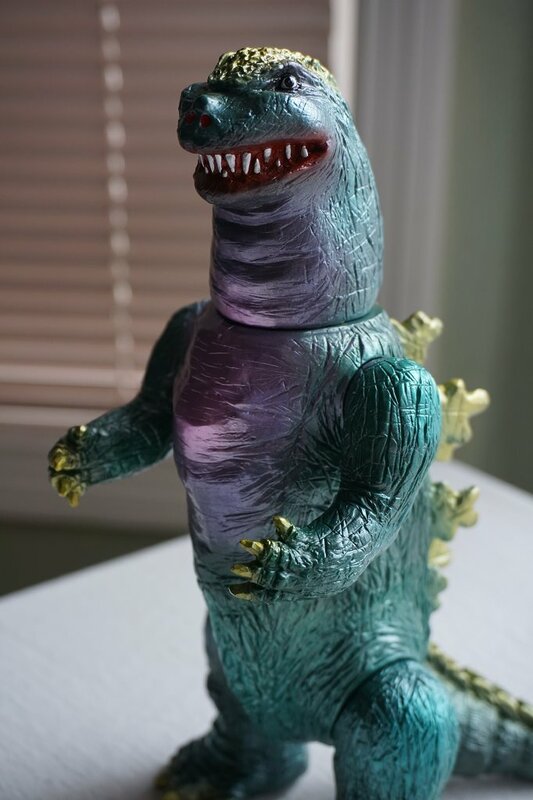 Steve (and correct me if I'm wrong here, Jon), I believe that Medicom releases separate runs per region for the Godzilla Vinyl Wars series, which this specific green RampageGoji falls under. There was an "Asia-only" release of the same version earlier this year, but there has been open pre-order with Diamond Distribution here in the US for over half a year now. That is where the shops like EE and The Vampire Robots are getting their orders from. I have seen this happen with a few other releases for GVW, and the US distro runs are usually delayed by months beyond the original expected ship date. I'm going to contact Entertainment Earth and ask them about it. I felt like I missed out on the Butanohana Vinyl Wars one so I was looking for others. Thank you for contacting us with your inquiry. As of right now, we still expect this item to arrive this month. Our apologies, but the vendor does not provide us with a specific date other than the month. Please note, all item information is subject to change per the discretion of the manufacturer, and we reflect those updates on our site if they occur.